Back from a popular trip we ran in 90's and early 2000's we're going all-out for an all-girls adventure! This Camp Like A Girl trip is both a great introduction to the outdoors for new adventurers as well as great challenge for those intrepid young women who are already comfortable in the wilderness. 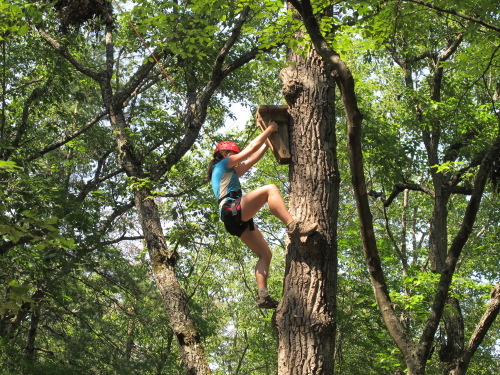 Participants will venture through the George Washington and Jefferson National Forests with the same variety of activities and challenge as our Classic Adventures, but this trip is ALL GIRLS! Our goal is to provide an exciting, supportive, and challenging experience to inspire confidence, leadership, and sisterhood.The Camp Like a Girl trip will be lead by two of our best female guides. Each day girls will have the chance to inspire each other, explore the wilderness of southwest VA, and challenge themselves in adventure activities. Each night, the leaders and girls will gather around the campfire under the stars to share stories, triumphs & struggles, and forge friendships. At the start of the trip, campers will learn the basic camping and back country skills needed for their week trip. They will also go through team building and high adventure challenge courses to learn more about their group members. At the peak of the adventure, girls will travel off Base Camp to hike, climb, and paddle through different venues. Everyday they will change campsites and have new adventures on rocks, trails, and creeks. Each night girls will bond around the campfire with their female leaders and fellow campers. As the week comes to a close, girls will return to Base Camp, invigorated, exhausted, and inspired where they'll enjoy a Friday full of WA's traditional festivities: the 900' Zip Line, The WAlympics, the Spaghetti Dinner, Closing Campfire! As part of the Wilderness Adventure philosophy, girls will backpack from campsite to campsite throughout our Base Camp and National Forest carrying with them their clothing, food, shelter, and water! All weight and distances are designed for an optimal balance of challenge and fun! Young women on this trip will gain a unique sense of self as they move under their own steam and learn to care for themselves and each other in a natural environment! One of the best outcomes of this fully female experience will be a chance to forge close positive relationships with other girls. By accomplishing group goals and seeing each other accomplish personal feats, girls will learn to support and lead others. Between tent partners, cook groups, canoe partners and more, girls will spark lasting friendships based on fun and adventure! Backpacking, camp fires, canoeing, zip lining, camping out, caving, and so so so much more is in store for the ladies on this trip. Each day will be filled with new experiences and challenges that will certainly grow any young woman's comfort zone. Possibly the most important aim of any of our programs, and central to the Camp Like a Girl trip, is to have a blast! Girls will leave this trip with a sense of confidence and independence. Being in the outdoors for a week cooking your own meals, sleeping in tents and facing challenging and different environments will develop a fearless attitude towards different circumstances. Besides that they will also bond with other girls learn from others and appreciate nature.
" The biggest success on my trip was making friends with all the other girls and being able to support them along the trip. the 6 mile hike was tough but a lot of fun!"